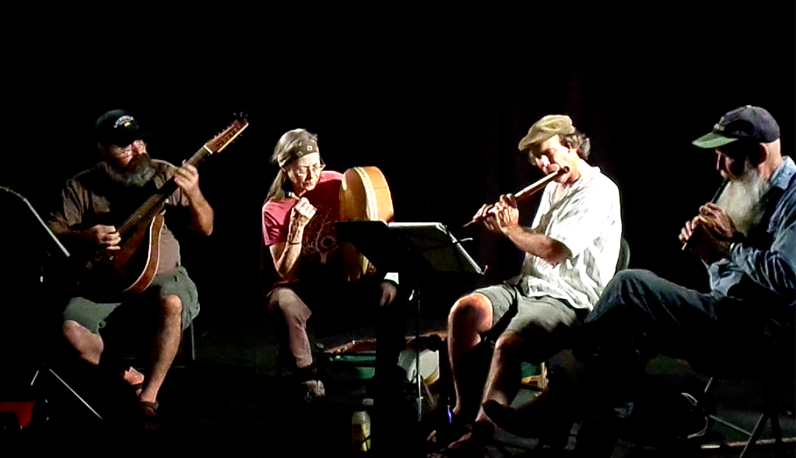 Blarney rehearsing on the Broadway stage. One of the brightest stars of Irish music in America was Francis O'Neill (1848--1936). Born in Tralibane, County Cork, he immigrated to Chicago where he worked as a police officer and soon rose to become Chief of the Chicago police force. He played the flute, fiddle and pipes, loved Irish music and was inclined to hire Irish cops who played instruments. But what made Francis famous was his zeal in collecting and publishing tunes that he and his buddies heard played by their fellow Irish immigrants. O'Neill's Music of Ireland (1903), his magnum opus, contains 1,850 pieces of music, which even today forms the backbone of traditional Irish music performances. By the 1950s Irish traditional music was rarely heard, even in Ireland itself, being considered outdated and old-fashioned, and supplanted by modern pop music and rock and roll. But in the 1960s, Irish composer and radio personality Sean O'Riada, was determined to bring this traditional music back into Irish consciousness through his Gaelic-inspired theater music, his radio broadcasts and his support of various music groups, most prominently The Chieftains. Through the efforts of O'Riada and others, Irish traditional music has spread throughout the world and one can now find Irish bands and music sessions everywhere from Croatia to surf city Santa Cruz. 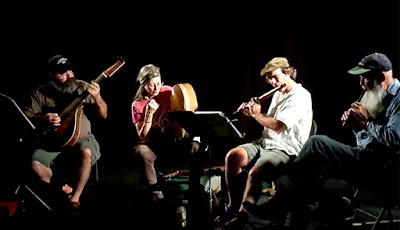 Following in the footsteps of Chief O'Neill, Santa Cruz's own Mike Long collected 1006 Irish tunes he heard played at Santa Cruz sessions in King Street Sessions Tunebook (more tunes than are good for you) (2000) which Mike has generously made available on the Internet. 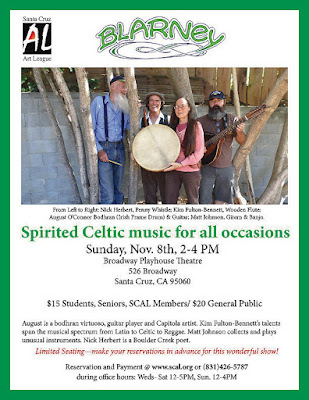 Sunday, Nov 8, from 2 - 4 pm, at the Santa Cruz Art League theater (located at 526 Broadway Ave), a group of four musicians calling themselves Blarney will be playing an assortment of tunes in the Irish tradition. Some of the tunes are new; most of the tunes are not. And many of the tunes appear in Chief O'Neill's collection (and Mike's as well). It would be almost impossible for anyone to play Irish music today without including more than a few tunes published by this scholarly Irish-American police chief. In the gallery adjacent the theater, the Art League will be hosting Beasts on Broadway, an exhibit by artists from all over America representing in many media animals both real and imagined. The gallery opens at noon on Sunday. Come early for the concert and enjoy the art beforehand. Thank you, Ginny of Anaheim. Cindy Odom just interviewed Blarney on KUSP radio. Can be listened to at http://www.kusp.org/archive/102.html# by clicking on Cindy's show = "Continental Drift". Interview begins around minute 52:00 and finishes at 85:30. Wonderful concert. Thanks to T Mike Walker and the Art League staff. And thanks to our wonderful audience who made this a most enjoyable and memorable event. You all laughed at just the right places and your attention brought out the best in our performance. None of our rehearsals were as good as this reality. Many thanks to everyone involved.